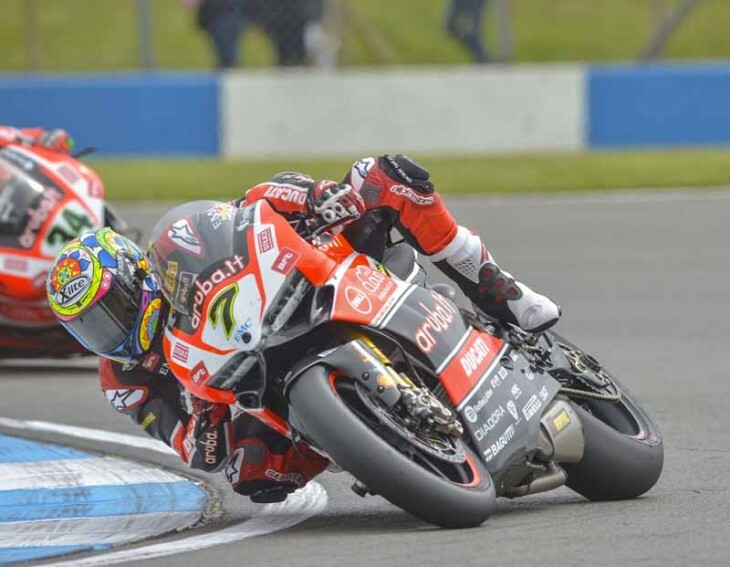 Donington Park (UK), Sunday 24 May 2015 – a well-deserved double podium for Chaz Davies and the Aruba.it Racing – Ducati Superbike Team at the Donington Park circuit in the UK today; racing at his home round, Davies crossed the line third in both of the day’s races. A more difficult day for Davide Giugliano, who was seventeenth and fifth across the line. Race 1 –cold but dry conditions for this first race of the day. Chaz, sixth on the grid, was strong off the line and lying fourth through the opening laps, behind Haslam, in third, and the two Kawasakis. Lapping with similar pace to Haslam, Welshman Davies was able to pass him on the sixteenth lap to move into third place, a position that he then held to the line, powering his Panigale R to a strong podium finish. From the front row of the grid, Giugliano positioned fifth through the early stages of the race. Unfortunately, on lap nine, a rear tyre problem forced him to return to the pitlane where his technicians put in a new tyre. The Italian then rejoined the race but was only able to do so much from last position and despite his best efforts, with too much time to make back up, Davide crossed the line in eventual seventeenth place. Race 2 – in the opening stages, Davide was lapping third while Chaz was lying fifth behind Lowes. After some swapping of positions, at the mid-race point the two factory Ducatis were in fourth (Chaz) and fifth (Davide), with both riders chasing down Haslam and Rea just up ahead. Davies got past Haslam on lap seventeen and, able to manage the final phase of the race effectively, concluded the race in third position once more. Giugliano battled with Haslam in the final stages of the race, crossing the line in final fifth place. Six rounds in to the 2015 championship and Davies retains fourth place in the overall standings, with 155 points, while Giugliano positions fourteenth, having earned 40 points. Ducati, thanks to today’s double podium, moves up to second in the manufacturer’s standings with 196 points.